A comment appeared on the Internet recently concerning Victorian steam boats and the Loch Ness Monster. It is not the first time it has appeared, and I think I ought to address this from my side of the Nessie debate. The argument runs that steam ship tourism was popular on Loch Ness during the time of Queen Victoria, so why do we not hear of any sightings from these passengers in the archives of books and newspapers? The argument is a corollary of the general argument that Nessie was just a 1930s fiction inadvertently created by fevered tourists whilst aided and abetted by a story-hungry media. Now, we do have stories of people seeing the monster from 19th century steamers. We have the accounts of Roderick Matheson and Alexander MacDonald but since these were brought to light post-1933, sceptics dismiss them as lies and exaggerations. But the argument, like most sceptical arguments, looks plausible on a cursory examination. However, when it is more closely scrutinised, it does not look probable. The word "plausible" is qualitative, but "probable" is more quantitative. We need some numbers here and the problem revolves around observers and sightings. Today, many more people visit Loch Ness and as a consequence, there are more than a thousand recorded reports of the Loch Ness Monster. Some will be misidentification, some will be hoaxes and others will be genuine sightings of our famous monster. But how does that map to mid-19th century Scotland? Before we can make the semblance of a quantitative assessment, we need an idea of numbers. The story of Highland tourism is one of a journey from seclusion and inaccessibility to one of improving infrastructure and prosperity. At the time of Samuel Johnson in the 18th century, most travellers either had a scientific, economic, religious or military purpose. In other words, Highland tourism back then was a bit like excursions to the Antarctic or Amazonian rain forests today. This was a worthy setting for our Loch Ness Kelpie to reside and rule. The building of General Wade's military roads after the 1745 Jacobite Rebellion eased access to major population centres, but the infrastructure for travellers such as places to rest and eat were in very short supply. The other hindrance was the native language of Gaelic and the lack of English speakers to communicate with. It was not until the mid 19th century that the pioneering explorer group gave way to the romantic traveller and aristocratic sportsman. 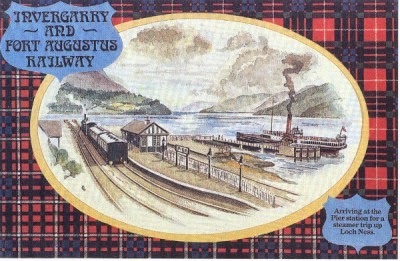 This was aided by the building of the Caledonian Canal, railways, the popularity of Walter Scott's romantic novels and the deployment of steam powered boats. Many parts of Scotland opened up to the traveller, but it was far from the massed hordes we see today. A continuing improvement in roads and steamer services, and particularly the extension of rail service to Glasgow and Edinburgh, greatly eased this burden, such that “thousands of summer tourists every year and from every part of the civilized world” [Murdoch 1867:l) ranged over the Highlands and Islands by 1867. It is here we first get a hint of the numbers involved as "thousands" made their way north every year. Indeed, the travel agency, Thomas Cook, was arranging travel packages to Scotland beginning in 1846 with a notable increase in the "middle and humbler classes". We are told he arranged parties of up to 200 people, the majority of whom, it seems, were ladies. In contrast, we are told he only ran four annual excursion trains from London (two each to Edinburgh and Glasgow). However, the main reasons for travelling to Scotland were not exactly those of the modern tourist. Many made the trip to fish the rivers, shoot the grouse and bag a stag. It seemed the ideal Scottish souvenir was one that could be stuffed and mounted on the wall. Others were attracted to the alleged therapeutic benefits of certain locations or grand vistas to indulge their artistic hobbies. By the end of the 19th century, major tourist hot spots had been established. We had Oban, Inverness, Strathpeffer, Fortrose, Tain, Golspie, Portree and so on. From our point of view, it is noted with interest that Inverness was described more as a route centre than a final destination in itself. However, by this time, Groome's Gazetteer only lists 170 inns and hotels in the area (not including fishing and shooting lodges) and their distribution reflected the high demanding for game. The relatively high cost of travel, and the time involved, the generally expensive nature of most of the accommodation, and at least until the early twentieth century, the absence of holidays with pay, meant that for the most part the Highlands and Islands remained the holiday area for a fortunate elite and were not subjected to the pressures of large numbers of visitors. So, we have indications of lower than supposed tourist traffic in the 19th century Highlands. Butler attempts to quantify that number by comparing the 1921 census with that of 1911 and 1931. The advantage to us is that the 1921 census was conducted in June whereas the others were done in April. Therefore, the difference in numbers should reflect the increase in tourists between April and June. As it turns out, the difference between April 1911 and June 1921 in the Highlands turns out to be 3,043 individuals. I'll say that again - only 3,043 individuals. Butler statistically alters that number to 7,143 to account for the average rate of decrease between 1911 and 1931, but it is still a surprisingly small number. Of course, we would expect July and August to be busier with a drop off into autumn. Assuming modern tourist flows all year round, what would the total projected number of tourists be? The graph below denotes traffic flows between Fort William and Mallaig in the years 2006 and 2009. Now, I have no idea how well this maps to changes in monthly Victorian tourism, but given the weather is the main driver of holidays, I suspect it will not be much different. So, given the known proportions for the other months relative to June we get the projected numbers below based on the assumption that the tourist season runs from May to September. So we estimate about 36000 tourists in the Highlands in 1921 and presume that this was pretty much the way of it in previous decades. But what proportion of these visitors went to Loch Ness? Comparing this to a recent study on Highland tourism, we note that there were 2.1 million visitors to the Highlands in 2010. How many went to Loch Ness? I have seen estimates ranging from 400,000 to 1 million. Clearly, the monster attraction of modern tourism does not apply to Victorian tourism, but the picturesque Great Glen and the "Royal Route" up the canal popularised by Queen Victoria still made this a top destination. Applying our modern numbers of 0.4 and 1 million to 2.1 million Highland visitors, would equate to about 6,800 or 17,100 annual visitors to Loch Ness in Victorian times. Compared to up to a modern million, that is not a lot. By way of confirmation, while I was researching, I found the book "From Sea to Sea: A History of the Scottish Lowland and Highland Canals" by Len Paterson. In this well researched publication, I found some hard numbers for Caledonian Canal traffic. We find that tariffs charged by the Caledonian Canal authorities changed in 1860. Whereas they were previously calculated by ship tonnage, they were now calculated by passenger numbers. From this we learn that in 1863 15,500 passengers used the Caledonian Canal. This proved to be a bit of a watershed year as the railways were beginning to reach the Highlands and this alternate form of transport was beginning to eat into steam ship numbers. Our calculation was an estimate between 6,800 and 17,100 (an average of nearly 12,000). So we were not far from the more accurate 15,500. So how does all this relate to the supposed absence of monster sightings in the mid 19th century? From this we can make an estimate as to how many Nessie sightings there may have been based on modern accounts. First, we need two numbers from the modern era of accounts. The first is the number of sightings since 1933. This is not too difficult to ascertain and we end up with a number close to 1250. The next question is how many people visited Loch Ness over that period of 80 years. That is not so easy to calculate as tourist numbers have varied quite a lot over that time frame. For example, we have the manic period of 1933-34 when hordes of expectant travellers went to Loch Ness. In contrast, we have the period of 1939-1950 which included the Second World War and the subsequent rationing of petrol and other items which hindered long distance travel to the Highlands. So 1933-1950 was a pretty volatile period and one is tempted to exclude it and concentrate on 1951-2013. Feel free to guesstimate tourist numbers for that period as I continue with a more statistically stable data set. That is one sighting every two years on average. Hardly a rate of sightings that would propel a Victorian phenomenon to escape velocity. Moreover, the actual number of sightings could be lower for two further reasons. Firstly, a proportion of the 806 sightings will be misidentification. Since there was no "Nessie Effect" back in the 19th century, these would have to be discounted. What that proportion could be is very much in the eye of the beholder. For example, if you think it is 10%, the 20 drops to 18. Secondly, tourists between 1951 and 2013 would likely be spending more time per person watching the loch, because, after all, there is now a monster in the loch. One should not assume that just because a Victorian steamer was in the middle of the loch, that passengers were more consistent observers of the loch. You had the distraction of the restaurant, the bar and your friends. In fact, the third class fare payers were normally kept below to keep them apart from the higher value customers who had more privileged access to the open areas. If you don't think there is a monster to look for, you're better off admiring the changing landscape rather than the repetitive wave patterns below. Indeed, boat passengers see less of the loch compared to land observers. Watch the loch from Urquhart Castle and you will know how far your vista expands before you. Being on the loch near surface level makes observation more difficult as a dark coloured object can be lost against the backdrop of the opposite shoreline (this argument is used by sceptics against Tim Dinsdale when he drove to the shoreline to find the creature after his famous footage). What this all means quantitatively is uncertain, but it seems clear to me that the only advantage of being on the water is that one in theory could be closer to the monster. But then there is the argument that Nessie stays away from noisy, threatening steam ships. In that decade tourists numbered never less than 9,300 and were as many as 14,800. After a gap this trade revived and grew back again to pre-war numbers, cynics attributing this to the publicity give to the myth of the Loch Ness Monster. So here we have a perfect opportunity to put Victorian era passengers numbers into a Nessie era setting. How many sightings were made from these boats? Paterson does not state which years these two numbers refer to, but I have no doubt that the high of 14,800 passengers were on the loch in the most manic year of 1934. Looking at the database of sightings I have, the total number of reported sightings in 1934 from steamships was exactly zero. That is despite there being nearly 200 reports for that year. There are three reports from boats (Donald Williamson, crew of "Sedulous" and A.G. Chambers), but none of these were excursion steamships. If anyone cares to tell me of any steamship based sightings for 1934, leave a comment below. The calculations here predicted one sighting every two years in the Victorian steamship age. Zero sightings in the one year of 1934 is consistent with that. It seems monster hunting from steamships is not all it is cracked up to be. In fact, this is a bit of a mystery. Why so few reports from boats? After all, even witnesses on boats can mistake birds, otters, waves, deer, etc from their vantage point. Why do we not even have a goodly number of lightweight reports that can be dismissed as known phenomena? It would be naive to simply suggest witnesses can better assess objects in the water. After all, an object 400 metres away is no more easier to judge than an object at a similar distance seen from land. Indeed, it could be argued it is harder to judge from the water. It would be tempting to suggest this has monster connotations, but the truth seems to be that there are simply not enough boat witnesses in proportion to land based witnesses to generate the expected number of reports. In conclusion, the claim that Victorian steam boat tourists should have been a rich source of sightings is not borne out by the numbers. Doubtless, some did see the monster. If they reported it to the Highland newspapers, they would have been dismissed. What their local newspapers back down in England made of these "kelpie" stories is unknown. It is not even known what proportion were reported to the media and what proportion of that proportion made it into print. What seems to be certain is that the supposed issue is not as big as some make out. NOTE: A follow up post has been posted here. I note that some of the books of the great monster hunter, Roy Mackal, are being sold on eBay. You can view them via this link.